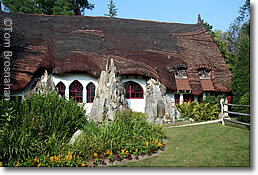 Sculptor Henry Hudson Kitson sculpted his studio from house-building materials into a fantasy thatched cottage out of a fairytale. English-born sculptor Sir Henry Hudson Kitson (1863-1947) studied at the École des Beaux Arts in Paris, then emigrated to the USA and set up house 5 miles (8 km) SE of Lee MA in the tiny village of Tyringham (map), once the site of a Shaker community. Although Kitson made such landmark works as The Minuteman in Lexington MA, The Pilgrim Maiden in Plymouth MA, and many bas-reliefs of Civil War leaders (now in Vicksburg National Military Park), his Gingerbread House studio in Tyringham may be his most famous work. He spent much of the last 25 years of his life—and most of his money—working on it. With a 45-foot (14-meter) ceiling, stained glass windows, a goldfish pond, and an 80-ton (73 metric ton) concrete-and-asphalt-shingle roof, Santarella is a unique fantasy structure that looks much smaller and simpler than it is. The 20th-century construction incorporates several much older farm structures, including two silos and parts of a barn. Behind the studio are elaborate gardens, which you can visit in summer. Today Santarella (tel 413-243-2819) is preserved as a hall for weddings, meetings and special events, along with its neighboring farmhouse, now a bed-and breakfast inn. See the Santarella website for more. Chesterwood, the summer home and studio of the great American sculptor Daniel Chester French, is not far away in Stockbridge MA. Santarella, the fantasy-cottage studio of sculptor Henry Hudson Kitson in Tyringham MA, near Lee.